Before seriously indulging with logo creation and graphics designing for your advertisement, take some personal time to think about logos, which you remember. Have you ever wondered why some logos are deeply etched in your consciousness? Because they had a great visual appeal. You cannot forget them for a lifetime. In digital advertising, this trend of visual content marketing is taking over photos and videos. 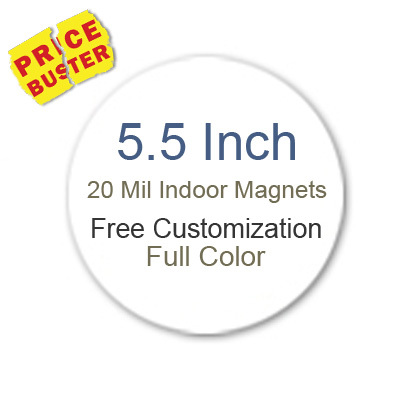 You can recreate the same magic by printing your logo or graphics over circle promotional circle magnets 5.5 inches. You can seek benefits of free full color printing offered by many online e-retailers stocking full color magnets to excel in your purpose. Gone are the days, when chomped fluff offered by marketers without questioning. Today, marketers are emphasizing on good quality content over the fluff and they can easily practice it over these circle magnets 5.5 inch. Personalize your business messages to sound soft and friendly. For example – All these years, you have advertised your products or services saying – Avail 10% discount on winter creams. Big Christmas Sale. Free, Free, Free. Although such terms helped you to conjure sales, but they may not work now because customers are looking at advertisers who make them feel at home. Use soft and friendly terms such as – Make Your Christmas an Affair to Remember by Shopping at XYZ. Grab this product at half price than the original pricing. Narrative style of marketing is already in practice. You might have read several user guides and white papers over the years, which narrate, how people have responded to the product. Perhaps the working space over 5.5 inch circular magnet may not allow you to build a white paper, but it definitely encourages you to sound interesting. Try to be narrative with short sentences, which arouse customer’s interest. Think it this way – you have a met a friend at the party, who happens to be a successful businessperson, too. Would you be interested to listen about his sales figures or business metrics over years? Perhaps no right? What else would you expect? You would love to go back in memory lane, or catch up with recent events or discuss on a common interested topic, isn’t it? You should try to advertise your product in a story-telling format, which enchants a customer. You can experiment many other formats of impressive content over these customized circle magnets 5.5 inches to influence a customer. On purchasing from any reputed e-retailer, you can save on online design proof, art setup, shipping and full color printing because they are offered FREE.